With a 2 Rosette award from the AA, the classic English menu encompasses modern twists. 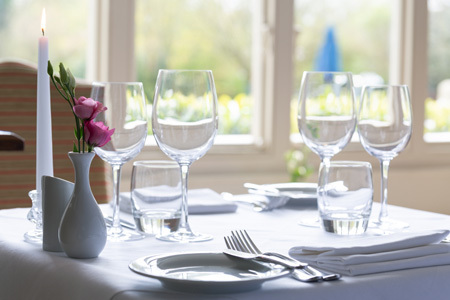 The restaurant at Mill End is a highlight for both new and returning guests with its seasonally changing menus, beautifully presented dishes and excellent value for money. The quality of the food, including free range eggs, vegetables and the finest of beef is the result of Devon itself, with its extensive range of high quality local produce and the freshest of fish caught of the Devon and Cornish coasts. The team in the kitchen, led by head chef Darren Knockton, is committed to using all the local area can offer from fabulous and varied cheeses, wonderful beef, lamb and pork, and superb game. The restaurant is open to residents and non-residents daily for lunch and dinner. We strongly advise you to book a table for dinner in advance, particularly on weekends. Simply email us, call 01647 432282 or book online below. We also renowned for our fabulous Devon Cream Teas or new Classic afternoon tea, best enjoyed in our lounge in front of the log fire, or in warmer weather in our gardens here at Mill End. As Head Chef at Mill End, it will be my great pleasure to welcome you to our restaurant – whether you are staying with us or just visiting for dinner, a spot of lunch, or a traditional Devon Cream Tea. Our passion lies in simplicity – great seasonal ingredients from local suppliers, cooked with care and presented with flair. With a background in fine dining, my aim is to achieve balanced and appealing dishes, without pretentiousness. We aim to home-produce as much as possible – for the best quality, and to reduce “food miles”. Our delicious cakes, traditional Devon scones, breads, soups, sauces and accompaniments are produced in our own kitchens – and we use herbs from our gardens when in season. Even our bottled water is produced in-house, using a sophisticated seven-stage filtration and purification system. Breakfast Hearty A hearty Mill End breakfast is a great way to prepare you for a day on Dartmoor. Lunch Indulgent An indulgent choice of tasty, tempting and delicious lunchtime treats to enjoy. Afternoon Tea Classic Our classic cream tea with freshly baked scones, clotted cream and local jam. Dinner Tempting Fresh, local, seasonal produce, prepared with care and presented with flair.